How can one understand Rudolf Steiner's use of the word "we" in the last part of the Foundation Stone Meditation ("What we found from our hearts and direct from our heads with focused will")? What characterizes this "we"? 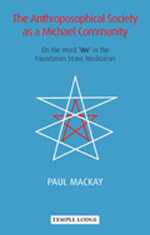 In the first part of this original and inspiring work, Paul Mackay takes this question as a point of departure, developing a unique approach to working with the seven rhythms of the Meditation. Based on personal experiences, he comes to the conclusion that the rhythms are an expression of the members of the human constitution, with the "we" in the fifth rhythm having the quality of "Spirit-self". The second part of the book considers the same "we" from a karmic perspective, with reference to Rudolf Steiner's karma lectures, events in the fourth and ninth centuries, the mystery of death and evil, and the restoration of karmic truth. PAUL MACKAY, born 1946 in Hong Kong, studied economics in the Netherlands and business administration in France. After working in international finance, he met and studied Anthroposophy in England and Germany between 1974 and 1977. From 1977 until 2012 he was active in anthroposophical banking, as co-founder and Executive Director of Triodos Bank in the Netherlands, and then Executive Director of GLS Bank in Germany, and later Chairman of its supervisory Board. As of March 2012 he is President of the Board of Directors of Weleda AG in Switzerland. In 1996 Paul Mackay joined the Executive Council of the General Anthroposophical Society at the Goetheanum, Switzerland. In 2000 he additionally became leader of the Section for Social Sciences of the School of Spiritual Science.